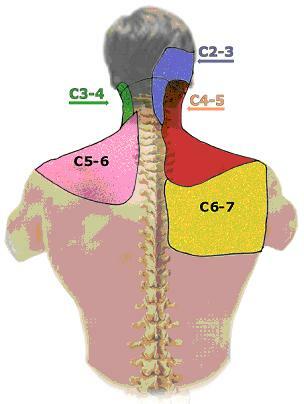 Injury or inflammation of the cervical facet can led to neck, shoulder and headache pain. The cervical facet is a joint in the posterior aspect of the cervical spine. It functions to provide stability and guide motion. Cervical facet pain is common in patients who have sustained a whiplash injury, trauma to the neck or undergone cervical fusion. Physical examination is typically significant for restriction in range of motion along with pain. Each joint has a distinct referral pattern illustrated below. 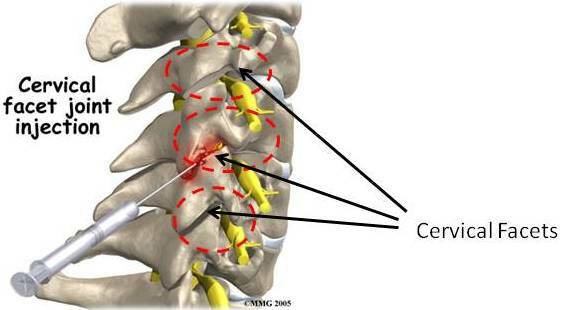 The Centeno-Schultz Clinic are experts at diagnosing and treating cervical facet dysfunction. Injury to the joint is not commonly detected by conventional radiographic studies. A thoough understanding of the mechanism of injury is essential. Successful treatments include intra-articular facet injections, prolotherapy and burning of the nerves which give sensation to the affected cervical facet (radiofrequency ablation).